Greg Rizzer of Visceral wants to make Army of Two: The Devil's Cartel a Michael Bay kind of game. "Even if it's a game that's violent in content," says Greg Rizzer of Visceral Games Montreal, "we still as gamers need to be able to appreciate a Michael Bay-esque type of experience." Which is why the developers of Army of Two want to take the franchise back to old-school fun; taking things too seriously is the last thing the developers want. The fratboy tone is a little muted this time out in The Devil's Cartel, says Rizzer, but the aesthetic is still over the top. "To me, when you look at video games and you see the reaction of people who are playing it and are like, 'whoa! '," says Rizzer, "that's the reaction you're supposed to get from when you were a kid and used to go to the arcade and see the first boss battle after playing Ghouls 'n Ghost or whatever." That's what Rizzer's hoping players of Army of Two will get out of its co-op shooter. "In that sense it is old school," says Rizzer, arguing that the best thing about old school was that you didn't need to know millions of different things; you just had to be amazed by the on-screen action. Visceral's hoping that it's latest game, Army of Two: The Devil's Cartel, will deliver on that promise. "We're good at what we do," says Rizzer. "We know what works for us and we're just going to continue to deliver on that." 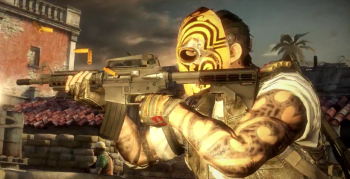 Army of Two: The Devil's Cartel is due March 28th for PS3, and Xbox 360.